On the haunting flares – to the end, to the end, they remain. For all so much of my research has been about the Leeds Pals, I have a closer link to another of the Leeds battalions – the Rifles. My Great-Uncle William was a rifleman with the battalion and when Pen & Sword offered this book for review, I jumped at the chance to read it, in the hopes of finding out a little more about the men and indeed, the very experience, that my relative had. He left us with no diary or papers and all we have left of him are two photographs and a letter he wrote to his niece. Andrew Kirk’s book Leeds Rifles: Written in Letters of Gold tells the story of the Rifles from their formation as a battalion in the mid 1800s to the last 100 days of the First World War and then beyond that to their legacy. The whole book is extraordinarily detailed and draws on many different sources, from photographs to first hand accounts of the battles undertaken by the Rifles. Kirk does not neglect the less experienced reader of military history and he readily explains the makeup of the battalion early on, in a way that is clear and easy to understand. In the first half of the book, the way in which the Rifles were a key part of the peacetime Leeds community is accurately drawn. Kirk recounts the rugby matches played in Armley and the two weeks ‘holiday’ (annual camp) at Scarborough. As war was declared, Kirk manages to give clear context and just about shoehorns all the myriad of reasons for the beginning of the war into a few paragraphs – not overly detailed, but then this is not a book about the reasons for the escalation of the July/August crisis of 1914. The change between peacetime volunteering for the Rifles and the apparent sudden slide to mobilisation is neatly handled – contrasting the vibrancy of the annual Scarborough camp with the sudden orders to return to Leeds. However, the Leeds Rifles first Christmas of the war was to be spent in York awaiting orders after the shelling of Scarborough coast earlier in December. The book takes us along the journey with the Rifles to France from Folkestone and it is from here that the book truly gets into its stride with quotations from the Riflemen themselves, communicating everything from the joy of some working class men to be out of England for the first time in their lives to the sheer noise that accompanied the opening of the Aubers Ridge Battle. Alongside quoting and referencing from the battalion diary, Kirk also uses the unofficial ‘other war diary’ kept by a succession of different officers wherein the roll call of officer casualties was kept. This makes for sobering reading and the short eulogies of the men bring them ever more to life, even beside the loss of their comrades. Kirk places each of the movements of the Rifles in the wider context of the war, and when the clock turns to 1918 and the Battle of the Lys, he references Haig’s now famous ‘backs to the wall’ order. With this, and the additional information from the orders provided by the Major Generals, the movements and battles are placed within their key context and are thus clearer and easier to understand. Overall, I’d definitely recommend this book if you have an interest in the Leeds Rifles and want to know more about their war and the people within the battalion! I’m always one for a good book (if you hadn’t already guessed!) and this time, I’ve been reading one of the latest releases from Pen and Sword, Escaping Soldiers and Airmen of World War One. 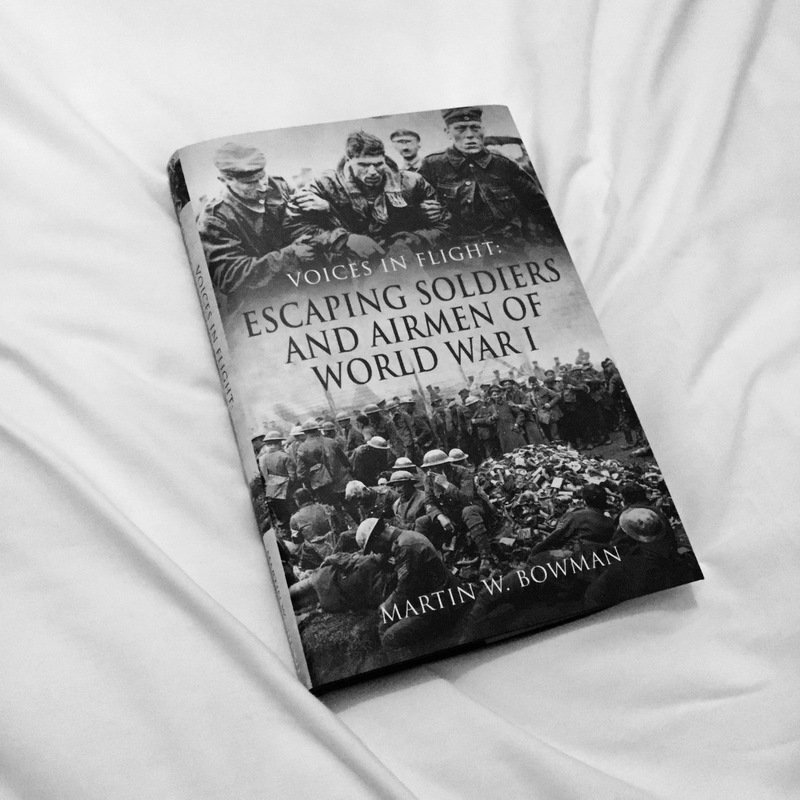 This book looks at the many different men who became POWs during the First World War, and is a really great read. It’s the first one I’ve dived into since I graduated this summer and it’s kept me hooked – which is a great achievement. It focuses primarily on the stories and lives of several different men of different nationalities, all of whom were taken captive as a POW during the war. The book also covers stories from the German side of the conflict which is exciting in itself as I for one find myself tending more towards the British and commonwealth experience when I choose my reading material. This book draws therefore on a broad range of experiences, making it all the richer for the reader. Bowman’s book also captures glimpses of life within the camps; how they operated and also how prisoners spent their time. He describes one Welsh camp for German prisoners wherein they were allowed to play cricket, and by some accounts they were also given cooked breakfasts, wine and cigars (though not all at once I expect!) understandably the locals were rather peeved at this idea! I heartily recommend this book for an extremely detailed, nuanced look at the prisoner of war experience, for both British and German captives and too, for some extraordinary tales of ingenuity and cunning! Many thanks to the lovely people at Pen & Sword who sent me a copy of this amazing book – it can be purchased on their website here ! 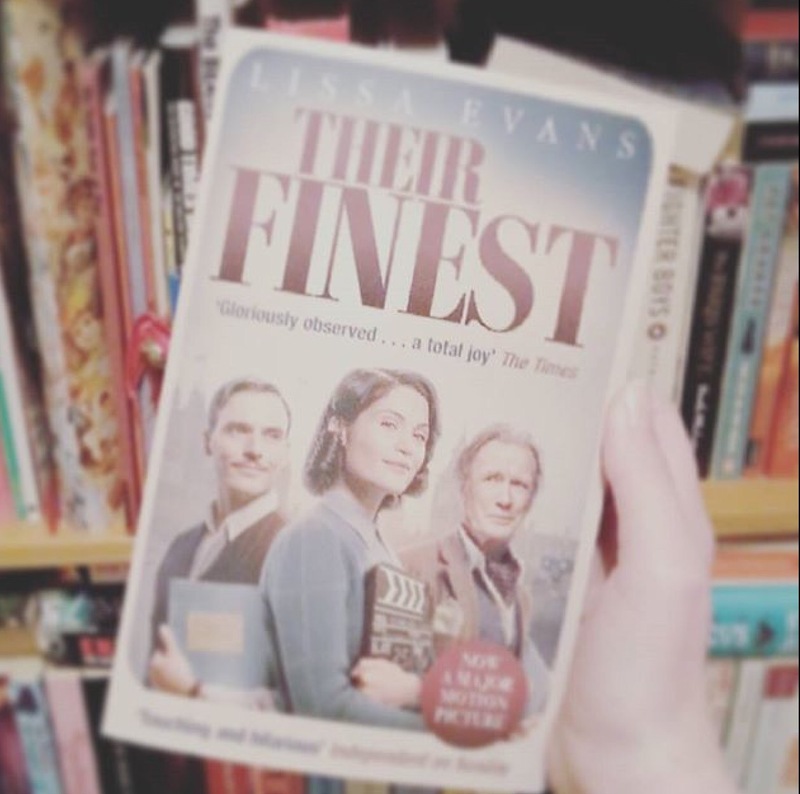 The film is adapted from a novel by Lisa Evans entitled Their Finest Hour and a Half, and stars Gemma Arterton, Sam Claflin and Bill Nighy, amongst other famous faces. It tells the story of the creation of a full length propaganda film created by the Ministry of Information about two sisters who take a fishing boat to Dunkirk. Gemma Arterton is Catrin, the only female writer in a team otherwise consisting of two men who regard women’s dialogue as ‘slop.’ The film within a film aspect clearly highlights the differences between the order of a film set and the chaos on the streets of London. There are moments where it is almost a love letter to the cinema of the Second World War, gently self referential but never excluding the audience – rather inviting them inwards to the same world it occupies. It tells of the enrapturing power of film at a time when there were incredibly few other escapes available. Gemma Arterton is wonderful as Catrin – she’s not one of those female characters who marches in and completely overturns the status quo in an entirely unbelievable manner – she is eminently believable which makes all the difference. Claflin is equally arresting as her colleague, Tom Buckley, with whom she spars and jokes as they work together to produce a film that will lift the hearts of the public and yet still remain true. Their scenes together are full of both pathos and comedy with only one or two straying into the realm of cheese. A scene wherein they argue beneath a ‘bombers moon’ errs rather on the side of cliche, but in such a lovely film that otherwise manages successfully to paint the blitz without too much saccharine, the odd moment is forgivable – especially when it comes to emotions. One scene which stood out was one where Catrin is caught away from a shelter as the bombs begin to fall – she huddles beside a shop window for cover until the planes pass. On rising to her feet, amidst the smoke, she sees the shillouettes of bodies and her natural reaction is horror, upset, mounting distress even. On noticing they are mannequins, her upset changes to laughter but then sharply again to horror as she comes face to face with the body of a young woman who she followed out of the tube station moments earlier. Catrin bends at the waist and retches, silhouetted in an archway against the cold light of evening. A comic moment turned abruptly to the real horror which confronted people on a daily basis – not brushed over or ignored, but presented to the audience without rose tinted glasses. There are other, similar moments that carefully place the actual effects of the war to the forefront – when Tom has died, Catrin is not suddenly paralysed by grief, but nor does she jump straight back into her work – the film gives her space to react and to showcase that reaction – mourning, tears and all. Bill Nighy is magnificent as Ambrose Hilliard, an aging actor who’s best roles appear to be behind him, cajoled into a role with the MoI by his agent. His moments of arrogance are comic, but there is weight behind his frustration when he remarks that the war has taken the cream off the top – leaving everyone with only rancid curds. Though he storms from a restaurant in this scene, it is clear he is remarking on more than the dilapidated food rations available. It’s a gorgeous film, a colour palette of greys, blues and creams gives it a muted look without ever being washed out or dull – a palette often used in many films set in the Second World War – The Deep Blue Sea and Atonement are two which come to mind. It does work well however, contrasted with the brighter moments when the crew are filming at the seaside. There are funny moments (in the cinema where I was, laughter was audible on many occasions), touching moments and an ending that I didn’t expect but one which fits better I think, than a traditional happy ending. Overall, for me, it was a perfectly lovely way to spend an hour and a half. I can’t comment on historical accuracy per se, as I know little about the day to day workings of the Ministry of Information, but I certainly recommend, if only for the wonderful performances and the sight of a Second World War film, mostly free of schmaltz. For my first post in 2017, I want to talk for a moment about the upcoming film adaptation of Journey’s End. I was entirely unaware of it until I came across an article in The Guardian just before Christmas, to be found here. Anyone who follows me on twitter will be aware that the article immediately made me rather angry with its assumption that women do not read books on the First World War, and apparently want nothing to do with it unless it’s all nicely digestible as a play (?!). Really, it’s not as though women have written books on the First World War or anything of the sort..
Aside from my anger at the needless comment regarding gender and apparent interest or lack thereof in the First World War, I was somewhat nervous (and remain nervous) about this adaptation. I adore Sherriff’s play and have seen it as a piece of live theatre – harrowing, intimate and deeply affecting, it has stayed with me for a long time. For me, one of the aspects of the play that I consider to be important is Stanhope’s youth. As far as I can recall (as I don’t have the text with me at present) he is in his early twenties – Sam Claflin however is in his thirties. That takes away an aspect of his character that adds to the way in which the audience view how Stanhope gradually breaks down and the coping mechanism he elects to use. His youth adds another sort of melancholy; one of his older subordinates looks upon him as a son more than a commanding officer, and having Claflin play Stanhope removes this element of the relationship between Stanhope and those he commands. Secondly, I am just generally hesitant about the film as a whole. The poster feels a little cloying, the tagline ‘innocence lost. courage found’ is..well. Probably not what I would have gone for – it feels a little overwrought and not necessarily relevant. The depiction of Stanhope’s gradual breakdown and his relationship with Raleigh are what I feel anchor the play so firmly – if either of these are handled badly, one wonders what the film will end up becoming. Still, one cannot judge a film that has not yet been released on the strength of the cast and one poster! I’d love to hear what everyone else thinks of this upcoming adaptation – optimistic? wary? not-all-that-fussed? I was lucky enough to have chance to interview an author who’s work I am extremely interested in. Tim’s book details the story of several characters from the First World War who stayed behind in France once the war was over to find and bury the bodies that were left by the fighting. Below is the interview we conducted – via email mind! – where did you get the idea from – what inspired you? Two things got the ball rolling. I was doing some research into a relative who served in Flanders during WW1 and discovered that his battalion had been destroyed in early 1918. The soldier was transferred to a unit I’d never heard of called an ‘entrenching battalion’ and I was inspired to find out more. Some time later a chance conversation with a friend intrigued me. He said a relative of his had suffered from the effects if gas – in spite of not serving abroad until 1919. It was news to me that soldiers were still being sent abroad in 1919. And I was intrigued to know what he was doing – and how he’d been gassed. Can you tell me a little more about the book? It’s a war book (obviously) but a war book with a difference. First, the action only starts once the guns stop firing. And rather than battles, attacks, it’s about the aftermath – the enormous clearing up operation that involved finding and burying the thousands of bodies abandoned on the road to victory. But it’s also about the individual aftermath for the men involved – all of whom, to some extent, can only cope with the end of the war by remaining abroad doing the Empire’s dirty work. What was your research process before you began writing – or did you research as you went along? Both, really. I spent a lot of time reading just about all the books on the subject that I could find. I also spent some time trawling the archives of the Imperial War Museum as well as going to Flanders, staying in Ypres and walking the streets and the battlefields described in the book. Are there any particular stories you came across during researching that stuck with you more than any other? The exhumation of the battlefield cemetery at Wild Wood was especially poignant (you can read an extract describing it on the Unbound website). Is there a character of yours whose journey moves you more than any other, or even a character who you favour a little more over the others? The main protagonist, I suppose, has to take centre stage and it’s his journey from battle-scarred veteran suffering what would now be called post-traumatic stress disorder to a man if not at peace with himself, then certainly at peace with his past that is the book’s central theme. But that personal journey mirrors the wider social journey as a country devastated by war slowly comes to terms with what has happens and starts to think about the future. The cemeteries and monuments kept by the CWGC are always beautifully maintained; is there one that you feel you have a connection to? There are some tiny battlefield cemeteries on the Somme that are especially memorable – places like New Munich trench cemetery near Beaumont-Hamel where around 100 men are buried, usually from the same regiment and often close to where they fell. But my favourite is probably Ypres ramparts cemetery because of it’s location on the eastern ramparts of that devastated city as well as its stunning beauty, especially in autumn. There are many heart-felt epitaphs on some of the gravestones out in France, are there any that you found particularly moving, or that you chose to feature in the book? The original title of the book was ‘Known unto God’ which appears, of course, on thousands of headstones. In terms of the book, it’s appropriate both to the work of the exhumation company about whom the book is written and to the central secret that keeps the main character, Jack Patterson, in Flanders finding bodies, digging graves and avoiding something – or someone – back in England. You’ve chosen to use Unbound to publish your work – why have you decided to go down this route? They were the first people to see the MS and they liked what they read and were immediately encouraging. And I like what they’re doing. I’ve been published ‘traditionally’ a number of times by a number of different publishers and haven’t ever felt in control of what was happening. I like the fact that artistically I’m wholly responsible – which mean I’ve got to persuade the public that what I’m doing is worth reading! That’s hard work but I think there’s a decent chance of getting better books this way. I was am Unbound customer long before I become one of their potential authors and I’m delighted to have supported so many books that I really wanted to read, but which might not otherwise have been written. If you are interested in donating to fund the publication of Tim’s book or want to find out more, check out his Unbound page here! the souls of the faithful are in the hands of God. I am used to seeing men on war memorials, on the cenotaphs that stand in the centre of towns, the neat white headstones of the CWGC, memorial tablets that hang in churches as they commemorate the sons and fathers of the parish. I often seek them out in new places that I visit, wondering about the men whose names grace the walls of a church, where their service led them and who it was they left behind. What I do not often see however, is the names of women on these memorials, be they from the First World War, or the Second. They are curiously absent from places where one might assume they be. After all, women served as nurses close to the front lines, they were employed as munitions workers and some died. I am aware of women who have gravestones which are maintained by the CWGC, but I have never been able to see any of them myself. Perhaps it has changed now, but I also found them absent in the curriculum in which I was taught. The war, to me at the age of twelve, was simply men and mud and trenches (as I am sure I have mentioned before) – there was no mention of the women and the part they played in the war effort. Of course, this was different when it came to being taught about the Second World War – perhaps because the home front was more of a component. I was therefore extremely pleased to find a war memorial with women on it. The memorial stands in Ripley square, a small town about ten minutes out of Harrogate. It’s a stone obelisk on which are two panels, one for the First World War, and one for the second. At the top are the names of those who lost their lives, and below this are the names of all from the town who served. It is a wealth of information, as after each name comes the regiment in which they served, as well as their theatre of war – another thing which I do not often see. The names of the three women are on the side of the memorial which is dedicated to the Second World War – Pvt. Amy Barrow (ATS, Home Service), Army Sister Maude Doris Mankin (QAINS, West Africa) and Sgt. Dorothy Clark (ATS). Perhaps sometime I’ll research these ladies and their service and I’ll most certainly keep an eye out for any women within the spaces for remembrance of the First World War. I expected there to be a lot more programmes on during the immediate Somme period but, unless I’ve just missed the majority of them, there haven’t been as many as I expected. Perhaps a good thing that there has not been a deluge – I’m not really sure. I feel like the commemorations have sort of finished up being the big three moments – 1914, 1916 and then 1918. It will be interesting to see what 2017 brings, but that is another thing entirely! This programme, Both Sides of the Wire (BBC Two, Mondays) states that it will tell the story of the Somme from both the British and the German perspective. I’m not sure how many episodes this series is scheduled to run, but this first one looked at July 1st, 1916. I thought the introduction to this show was really good – clear and informative and not sensationalised in the way that I find some shows tend to get. For many who already know about the Somme, there was not much new to be found in this segment. Many of the details throughout were good, including the use of statistics and primary sources (I love a good primary source, especially when its quoted!). I also liked the use of actual footage of the soldiers waiting for the command on the 1st July – poignant and striking – but not overused. It covered quite a bit of ground and I liked the way it was separated into the different areas of the front with a focus on a certain battalion, rather than trying to cover it all in one fell swoop in not a lot of detail. One of the niggles I had with it was that I felt the programme was a little more skewed towards the Allied experience of the Somme. I don’t know how much of this was just down to me, and if there was actually an even split between the two, or if the programme did focus a bit more on the Allied side of things – but that was just the feeling that I came away with. Furthermore, I would have liked a bit more on the Allied treatment of captured Germans – the programme did touch on this briefly, but did not linger. Overall, it was a fair enough programme, in my opinion. I learnt some new stiff, which is always good, and I’ll most likely tune into the second episode next Monday, but probably on iPlayer.